I don’t like rollercoasters. In fact I hate them! I am that one that will gladly wait at the finish with the coats and bags. However, The Crafty Lass is certainly on a rollercoaster right now. But this one I will gladly stay on for the ride. So far it’s been a lovely and pleasant journey – with quite a few more highs than lows. This rollercoaster I am staying firmly ON. In the last two weeks since my last blog post, we have finally been able to announce several pieces of very exciting news! Firstly, I am becoming an official tutor at The Women’s Institute college – Denman, in Marcham near Abingdon. 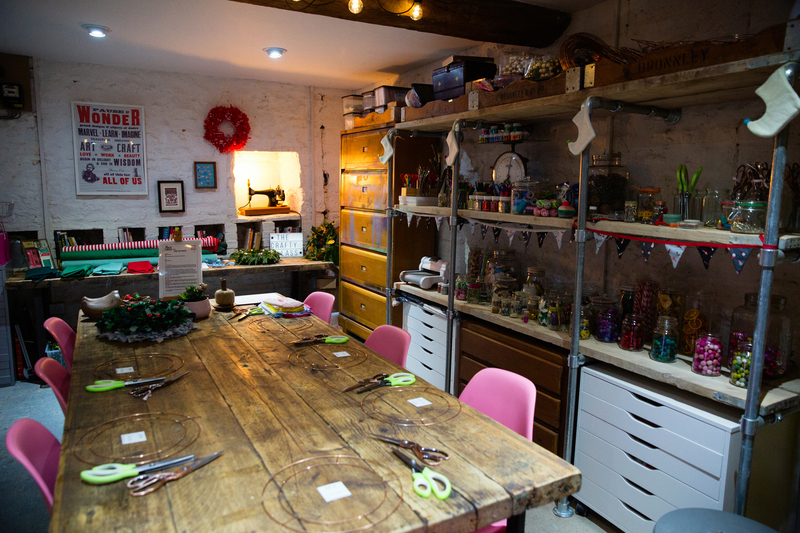 There are selected dates now live on their website to book in for 2019 and I will be teaching paper flower making, wood block printing and lampshade making! Denman college is the most beautiful quintessentially British building and I feel honoured to be able to teach there and for the WI. The courses are often residential and so the ‘higher’ price point – isn’t just for me teaching! It includes your accommodation and your (delicious!) food and drink too. 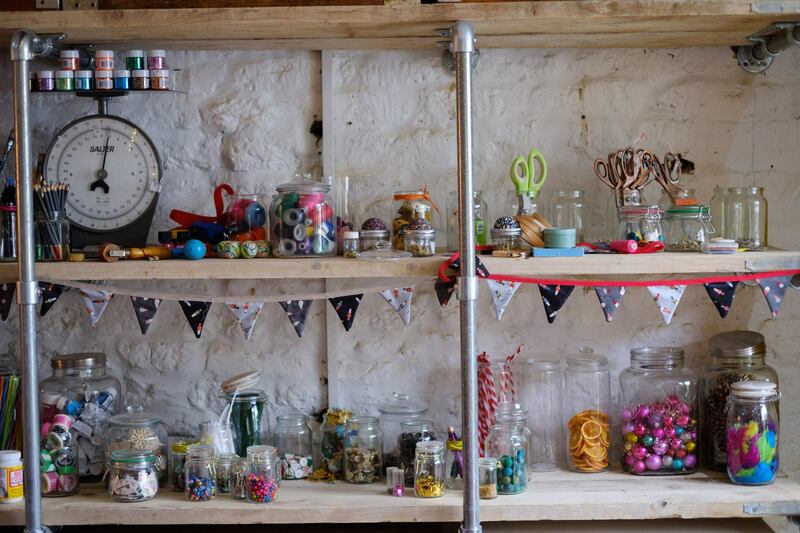 A craft retreat – what more could you want?! Additionally and unexpectedly we have also WON the former ‘Dragon’ Theo Paphitis’ SBS (Small Business Sunday) competition! 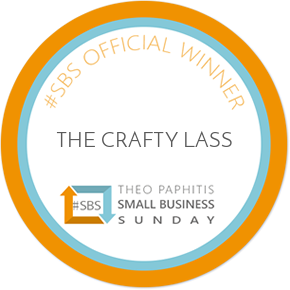 Well I say ‘unexpectedly’… I had been entering The Crafty Lass ‘on and off’ for about 3 years with a weekly ‘tweet’ pitch so I certainly hoped to win one day – but, it still came as a shock to be selected! So… just what is SBS? And what does that actually mean?! The SBS website explains it probably a lot better than I can, so see all about it HERE should you so wish to know more! Press wise – on the back of the SBS win, we featured in the local paper: The Banbury Guardian, and on their website. We are also going to have a brief Autumnal ‘crafty mention’ in Mother & Baby magazine in their September issue. And, if you are a WI member – keep your eyes peeled for an exciting feature in the October edition of WI LIFE magazine. This time, not about how to make anything – but all on The Crafty Lass! We also have some guest blog posts coming up featuring on the lovely Craft Cotton Co blog! Today – was a VERY exciting day. Today, we shared that I have been working on my own The Crafty Lass craft products over the last YEAR! And, it is now all happening in collaboration with the brilliant company – Craft Buddy. The first product will certainly be an ADVENTure… in fact it will be The Crafty Lass ADVENTure! Yes – that IS a CRAFT ADVENT CALENDAR! If you would like to know about this in regards to this – please visit www.thecraftylass.com/thecraftylassadventure to sign up to our mailing list for the latest news and updates. All these things have been shared within just the last 2 weeks… and, in addition to this believe it or not, there are also several other projects bubbling away under the surface that I am yet able to reveal… so watch this space! So, blogging used to be a thing. In fact – I should start that sentence again. It used to be THE thing. I am certainly minus the 9-5: it is great being self employed – you get to choose what 18 hours a day you work! There were ’21’ blog posts in March 2015. There were ‘0’ in March 2018. 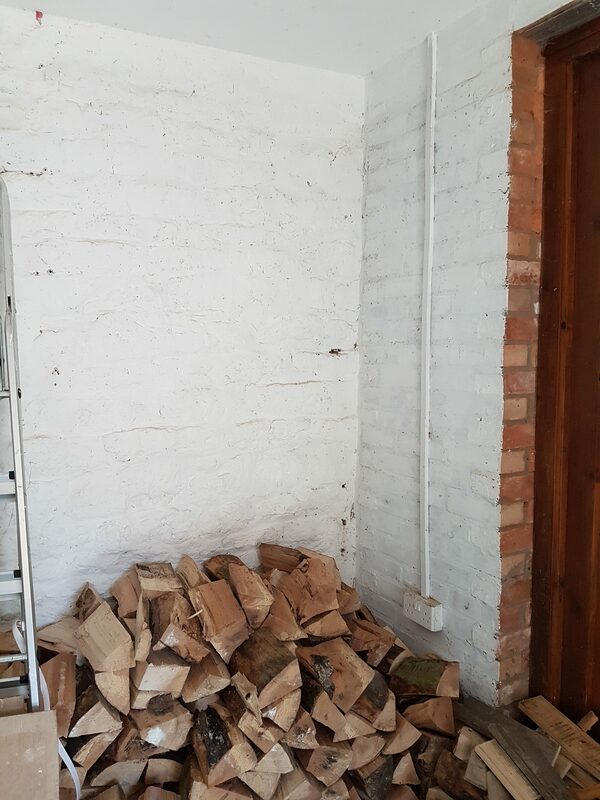 In a huge contrast to the earlier blog posts – where I knew what I needed to achieve in the day – like write a blog post, perhaps a mooch into town, meet Mrs XYZ for a coffee, have a meander around Waitrose whilst trying to figure out how I was going to sort out this ‘craft business malarkey’. Ironically all that mooching and planning, plus a dog and the aforementioned 19 month old, means I now have NO TIME AT ALL. Well, no spare time anyway. Things have escalated slightly… There is a to do list as long as my arm – from work out how to make a realistic ranunculus paper flower, to (just!) do a ‘stock take’, update GDPR regulations on my website, work on those (several) press and event commissions, work out where my car keys are, just where is the missing yellow stacking cup for little man, what are we going to have for dinner… No meandering around Waitrose aimlessly now. This isn’t a ‘oh, woah is me, poor Paula’ post. This is just a genuine honest view that self employment – although amazing… my gosh it is busy wearing all those hats! And, that for anyone that is close to me, and actually bothering to read this – I am sorry if I have gone wayward in responding to texts, to calls – I do care! Since those early blog posts 3 years ago, I am surely – living the dream? Well, a HUGE part of me is. My life has gone in directions I never knew possible, and the small (and big!) things I ultimately wanted to achieve – are happening. The dynamic of the business has changed. I miss blogging – but surely it is better be so busy going that you have no time to blog about what you are doing! I am discovering that dreams change. They adapt, they get BIGGER! We have featured in several local and national press articles: Prima Magazine, The Women’s Institute national magazine – WI Life, Mother & Baby, on the Telegraph website to name a few… National Press? Tick! 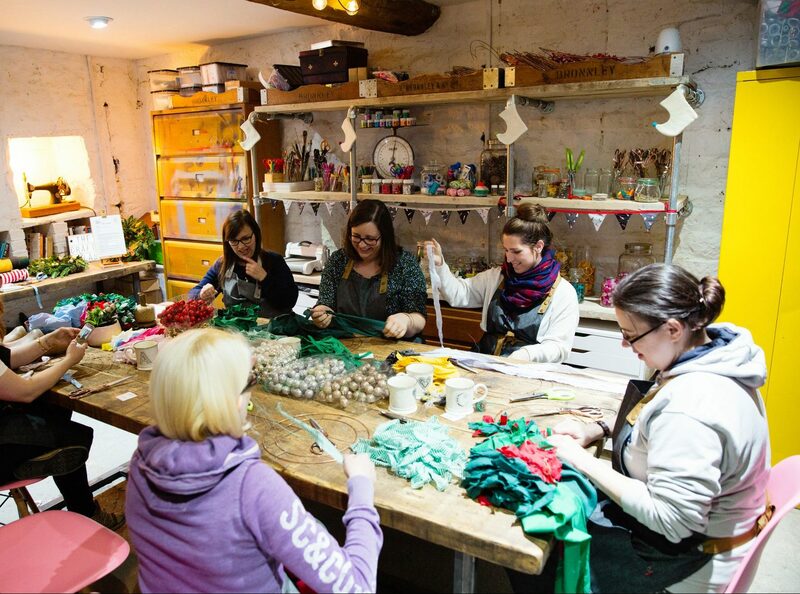 We have featured as a craft tutor at The Kirstie Allsopp’s Handmade Fair at Ragley Hall, Warwickshire – teaching workshops to lots of lovely crafters… Big ambition achieved there. Tick! And, as part of this – I was commissioned to make the ‘Super Theatre Main Stage’ display – 132 handmade paper flowers flowers, approximately over 2,500 petals (it took around 47 hours of flower making…) Never imagined this, but – hey, pretty exciting! I am working on product designs with several companies… Tick! Last night we hosted a ‘charity’ craft night – with all proceeds going to the Alzheimer’s Society – we were knitting Twiddlemuffs! What are they? Check out one of our previous blog posts (yes, I actually managed to post something on this!) BBC Radio Northampton were in attendance to film and record the event – and this will shortly appear on their social media and on the radio! Tick, Tick, Tick, Tick, Tick, Tick! It is all just happening… the cogs are turning, daily developments. It is exciting, it is KNACKERING! Knowing what I am like – I categorically CANNOT guarantee I won’t ‘work’ in that time ‘off’ – I actually already have lots of lovely things craft related planned in – as I am already thinking that would be a perfect time to make all my ‘Christmas’ demos! Yes – I cannot wait for The Crafty Lass Christmas in August! 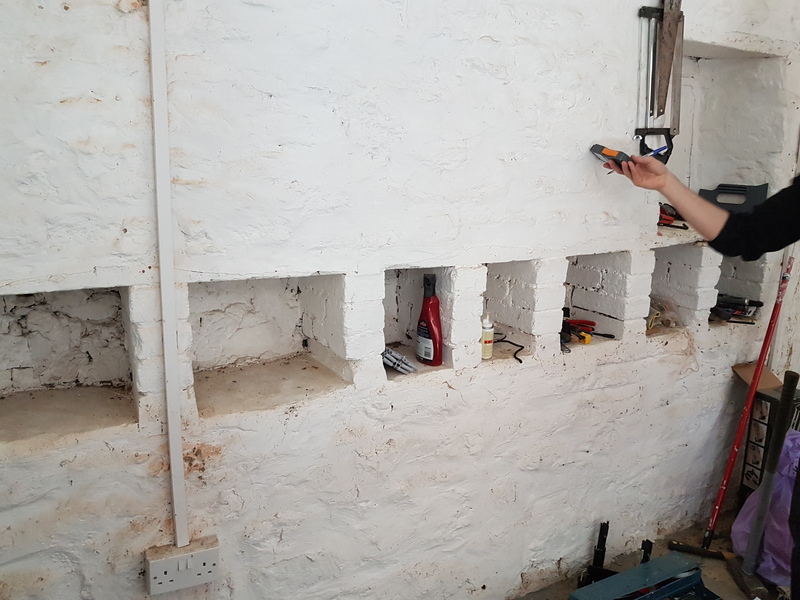 However, it will be a nice to do: to just ‘sit’ and ‘craft’ (if little person will let me…) and make things at my own leisure… as we also have some VERY exciting news for later this Autumn, Winter and in 2019 – so, we need to get ready for that! (Watch this space!) August will be some down time, a moment to stop – reflect – sleep – have some well needed family time. Oh, and to make festive sparkly things!!!!!! But, thank you – if you’ve got this far… for your own time, your support, your bookings. 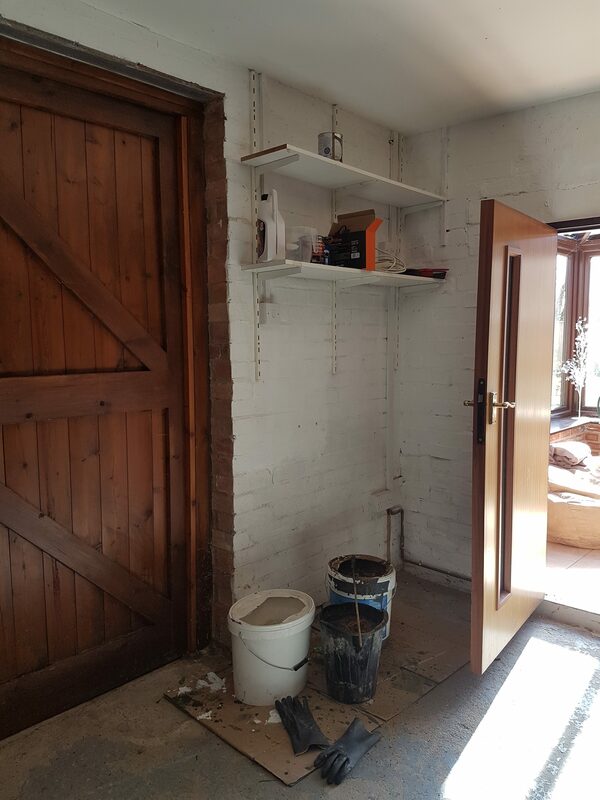 The Crafty Lass is going from strength to strength and I couldn’t have done it without you!